The first recorded Christmas celebration was in Rome in 336. Christmas played a role in the Arian controversy of the fourth century. In the early Middle Ages, it was overshadowed by Epiphany in January. The feast regained prominence after the year 800, when Charlemagne was crowned emperor on Christmas Day. Associating it with drunkenness and other misbehavior, the Puritans banned Christmas in England and some New England colonies for parts of the 17th century. Though restored as a legal holiday by the 18th century, it remained disreputable. In the early 19th century, Christmas was revived. The giving of coins, medals and tokens as Christmas gifts has a long tradition. Its origin perhaps lies with the gifts the Three Kings of Orient brought to Baby Jesus. 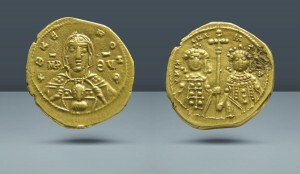 Traditionally, gifted coins have been gold or silver. The giving of coins has been also linked with Saint Nicholas, Santa Claus´ Fourth Century predecessor. According to the tradition, Nicholas was a wealthy man that came acquainted to a widower that had three daughters and that had fallen into hard times. The man wouldn´t accept charity, but Nicholas found out that his daughters used to hang their clean stockings to dry on the mantelpiece above the fire. One night he climbed down the chimney and placed a bag of coins in the oldest girl’s stocking. It was Charles Dickens and other writers that reinvented the holiday by emphasizing Christmas as a time for family, religion, gift-giving, and social reconciliation as opposed to the revelry that had been common historically. Judaea, Herodians. Chalcis. Herod V (Herod of Chalcis). 41-48 A.D., Extremely Rare !! !